Driving back from the AALS, I stopped for gas in Ashland and thought I'd go by and check out Randolph Macon College. One of RMC's antebellum presidents, William A. Smith, looms large in University, Court, and Slave. One indication of how long pieces of University, Court, and Slave have been in the works (though it was then called by the dissertation name of "The Intersection of Slavery and Property in Southern Legal Thought: From Missouri Compromise Through Civil War,"--and its focus was much more on property law than the current incarnation) is that I first read Smith's lectures on slavery in the stacks of the University of Oklahoma library. Not even in OU's rare book room -- that was one of the great features of OU's library. Lots of first editions were there on the shelf. Of course, it's available anywhere on the globe now, through the magic of UNC's documenting the south website. Anyway, the College was in Boydton, Virginia, back before the Civil War, so everything on the Ashland campus is post-War. It moved to Ashland in 1868. There are, however, several beautiful nineteenth century buildings on the Ashland campus, including Washington and Franklin Hall. So I, of course, am interested in what's left over in Boydton--a beautiful town near the North Carolina line. It's the county seat of Mecklenberg County. Alas, the sad answer is not much of the main building of RMC survives. As recently as 2003, the main building of the antebellum RMC (Centre Hall) still had a roof. Here's a very nice website with pictures of the building and other surrounding buildings, including the president's mansion--which still stands along Highway 58. Unfortunately, Centre Hall's in mighty bad shape now. There are no trespassing signs along Jefferson Street (which I, of course, obeyed). However, the view from the street isn't promising. I spoke with a woman at the convenience store (Triangle Grocery) two doors down and she confirmed what I feared: that the entire inside has collapsed. The outside, too, obviously. I don't claim any special knowledge here--but I'd imagine the building can't be saved at this point. Still, it's worth talking about the ideas in circulation in that building -- and (yup, you guessed it) discussed in the college's two literary societies. One of these days I'll have to make a stop by Ashland during the week and visit RMC's special collections to see what we can learn about the Washington and the Franklin literary societies and also the faculty minutes from 1835 to 1853. And -- thanks to the magic of book.google, here's RMC's 1848 catalog. Some pretty interesting stuff in there, including that RMC has a small medical college (at Prince Edward County Courthouse) and two preperatory schools -- and that at the Boydton campus there were about 109 students. The course of study looks pretty fearsome -- lots of Latin in there. They don't get to the good stuff (i.e., the stuff I'm interested in, moral philosophy, until their senior year). I'm hoping that the school's literary societies provided something richer in terms of politics and political theory than what is apparent from the regular curriculum. And on that I'll have some more evidence (at least as to UNC) pretty soon. Still, the trip over to Boydton was definitely worthwhile, because in addition to seeing what remains of Randolph Macon College there, I got another picture of a Confederate monument. 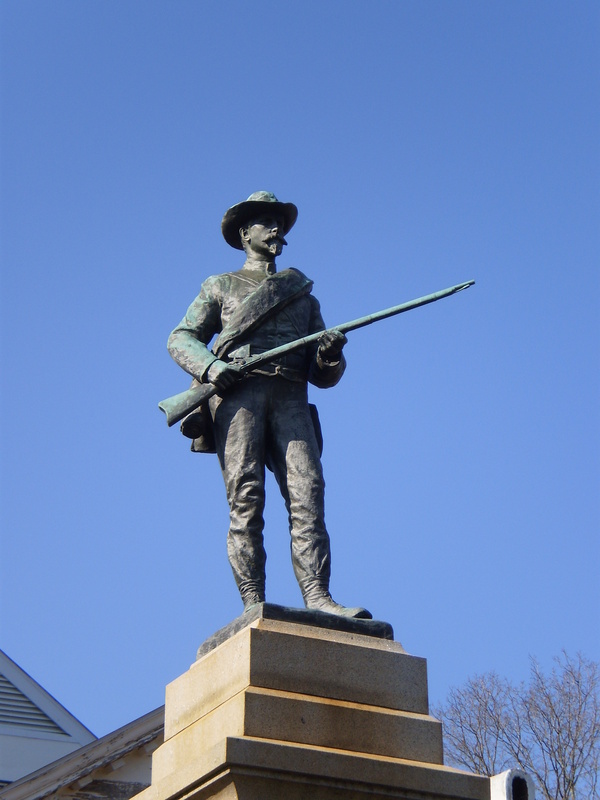 So let's see, this has been a pretty successful year for Confederate monument pictures; I've posted them from Nashville, Chapel Hill, and in Virginia, Courtland, Dinwiddie, and now Boydton. I've got nice ones of Columbia, South Carolina, and Pittsboro and Oxford, North Carolina, which I'll work into the discussion soon.